Long March 5 (LM-5, CZ-5, or Changzheng 5) is a Chinese heavy lift launch system developed by China Academy of Launch Vehicle Technology (CALT). CZ-5 is the first Chinese vehicle designed from the ground up to focus on liquid rocket propellants. Currently, two CZ-5 vehicle configurations are planned, with maximum payload capacities of ~25,000 kilograms (55,000 lb) to LEO and ~14,000 kilograms (31,000 lb) to GTO. The Long March 5 roughly matches the capabilities of American EELV heavy-class vehicles such as the Delta IV Heavy. The CZ-5's maiden launch was successfully completed on 3 November 2016, from Wenchang Spacecraft Launch Center on Hainan island. Its second launch on 2 July 2017 failed due to an engine problem in the first stage. Since 2010, Long March launches have made up 15–25% of all space launches globally. Growing domestic demand has maintained a healthy manifest. International deals have been secured through a package deal that bundles the launch with a Chinese satellite, circumventing the U.S. embargo. The Chinese government approved the development of the Long March 5 rocket in 2007 following two decades of feasibility studies. It was to be manufactured at a facility in Tianjin, a coastal city near Beijing. In 2008 the first launch of the Long March 5 was predicted to occur in Wenchang of the southernmost island province of Hainan, where a new satellite launch center was allegedly being constructed. The first CZ-5 rocket to be launched completed production and testing in Tianjin manufacturing facility around 16 August 2016 and shipped to the launch centre on Hainan island shortly after. The Chief Designer for the CZ-5 rocket was Long Lehao. The main objective for the CZ-5 rocket was to fulfill China's requirement for large payload to LEO and GTO missions for the next 20–30 years. The CZ-5 project was initially announced in February 2001, with initial development slated to begin in 2002 and the first versions of the vehicle to go into service by 2008. However, funding was only finally granted in 2007 as revealed by the developers during the Northeast China exhibition. On 30 October 2007, the construction of the CZ-5 production plant began in the TEDA West area near Binhai New Area in Tianjin. The production facility was constructed near the harbor to reduce the logistical problems associated transporting rockets over land and allow easier transportation by sea from Tianjin toWenchang Launch Facility on Hainan Island. The new production facility would have an area totaling more than half a million square meters and cost RMB 4500 million (USD 650 million), with the first stage of the construction scheduled to be completed by 2009. When the production facility is completed in 2012, it would be capable of a maximum output of thirty CZ-5s annually. As of July 2012[update], development of the 1,200 kN thrust LOX/kerosene engine was test fired. [needs update] New photos of CZ-5 and of its tests were released in March 2015. The first CZ-5 was shipped from the port of Tianjin in North China at 20 September 2015 for a rehearsal (some of the drills carried out at Wenchang Satellite Launch Center involved both the launch vehicle and a probe) of a scheduled Chang'e-5 lunar mission planned around 2017. [needs update] The first test flight was initially scheduled for 2014, but this subsequently slipped to 2016. The launch was planned to take place at around 10:00 UTC, but several issues, involving an oxygen vent and chilling of the engines, were detected during the preparation, causing a delay of nearly three hours. The final countdown was interrupted three times due to problems with the flight control computer and the tracking software. The rocket finally launched at 12:43 UTC. Also, according to an internet blogger on the Chinese microblogging platform Weibo, a minor problem occurred during flight and the rocket put the YZ-2 upper stage and satellite into an orbit that was less accurate than expected. However, the trajectory was corrected with the YZ-2 upper stage and the payload was inserted into the desired orbit. Its second launch on 2 July 2017 experienced an anomaly shortly after launch and was switched to an alternate, gentler trajectory. However, it was declared a failure 45 minutes into the flight. The cause of the failure was confirmed by CASC and related to an anomaly which happened on one of the YF-77 engines in the first stage. The YF-77 booster engine was test-fired in 2018 after CASC redesigned it. The next Long March 5 launch date was estimated to be in January 2019, but the has subsequently been pushed back to July 2019. The chief designer of CZ-5 is Mr. Li Dong of the China Academy of Launch Vehicle Technology (CALT). The CZ-5 family will include three primary modular core stages of 5.2-m diameter (maximum). The total length of the vehicle is 60.5 metres and its weight at launch is 643 tons, with a thrust of 833.8 tons. Boosters of various capabilities and diameters ranging from 2.25 metres to 3.35 metres would be assembled from three modular core stages and strap-on stages. The first stage and boosters would have a choice of engines that use different liquid rocket propellants: 1,200 kN thrust LOX/kerosene engines or 500 kN thrust LOX/LH2. The upper stage would use improved versions of the YF-75 engine. Engine development began in 2000–2001, with testing directed by the China National Space Administration (CNSA) commencing in 2005. Versions of both new engines, the YF-100 and the YF-77, had been successfully tested by mid-2007. The CZ-5 series can deliver ~23 tonnes payload to LEO or ~13 tonnes payload to GTO (geosynchronous transfer orbit). It will replace the CZ-2, CZ-3, and CZ-4 series in service, well as provide new capabilities not possessed by the previous Long March rocket family. The CZ-5 launch vehicle would consist of a 5.0-m diameter core stage and four 3.35-m diameter strap-on boosters, which would be able to send a ~25 tonne payload to low earth orbit (LEO). Six CZ-5 variants were originally planned, but the light variants were cancelled in favor of CZ-6 and CZ-7 family launch vehicles. Wikimedia Commons has media related to Long March 5. ^ "Successful Launch of Long March-5 Rocket". CCTV. 3 November 2016. Retrieved 3 November 2016. ^ a b "China conducts Long March 5 maiden launch". NASASpaceflight.com. 2016-11-03. Retrieved 2016-11-03. ^ "Chinese Long March 5 rocket". AirForceWorld.com. 12 June 2015. ^ a b c d "Long March 5 Will Have World's Second Largest Carrying Capacity". Space Daily. 4 March 2009. Retrieved 8 February 2016. ^ Henry, Caleb (August 22, 2017). "Back-to-back commercial satellite wins leave China Great Wall hungry for more". SpaceNews. ^ "Chinese Long March 5 rocket ready to launch". AirForceWorld.com. 17 Aug 2015. ^ Errymath. "First released picture of Long March 5 (CZ-5) Heavy Rocket". Retrieved 8 February 2016. ^ "China to rehearse new carrier rocket for lunar mission". English.news.cn. 20 September 2015. Retrieved 8 February 2016. ^ 罪恶大天使 (4 November 2016). "长征五号首飞纪实" [The first flight of the Long March 5]. Sina Weibo (in Chinese). Retrieved 8 February 2019. 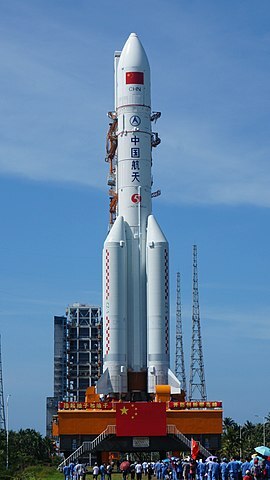 ^ "China launches Long March 5, one of the world's most powerful rockets". SpaceFlightNow.com. 3 November 2016. ^ 大脚丫的汤婆婆 (4 November 2016). "远征二号是两次点火，第一次近地点附近点火..." [Yuanzheng-2 ignited twice, with the first ignition near the perigee...]. Sina Weibo (in Chinese). Retrieved 8 February 2019. ^ "Chinese rocket launch fails after liftoff". CNN. 3 July 2017. ^ Barbosa, Rui C. (2 July 2017). "Long March 5 suffers failure with Shijian-18 launch". NASASpaceFlight. Retrieved 4 September 2018. ^ "Casc Confirms Cause Of Long March 5 Failure". Aviation Week. 2 Mar 2018. ^ "China test fires YF-77 rocket engine ahead of return-to-flight of Long March 5". Global Times. 28 Feb 2018. ^ "Chinese Long March 5 heavy-lift launcher ready for January 2019 comeback flight". GBTimes.com. Retrieved 2019-01-07. ^ a b c d e f g h i j k Pietrobon, Steven (30 January 2019). "Chinese Launch Manifest". Retrieved 8 February 2019. ^ a b Xiang, Meng; Tongyu, Li. "The New Generation Launch Vehicles In China" (PDF). International Astronautical Federation. Retrieved 21 April 2016. ^ Harvey, Brian (2013). China in Space: The Great Leap Forward. Springer Science & Business Media. p. 364. ISBN 978-1-4614-5043-6. ^ Zhao, Lei (21 April 2016). "6 versions of LongMarch 5 rocket inworks". usa.chinadaily.com.cn. Retrieved 23 April 2016. ^ a b c Kyle, Ed. "CZ-5 Data Sheet".